Free Beacon released their election roundup video today. An interesting development in Louisiana. Politico: The DNC is pulling their funding for the Senate runoff election on December 6. Nearly $1.5 million in ads are being pulled, as the Democrats feel it is wasted money now that the Republicans have secured the Senate. This surprises me for one reason: after Tuesday's bruising, I would have thoughts the Liberals Progressives Communists would have doubled-down on the Louisiana runoff election in order to produce some good news. $3m spent on ads, assuming it translated into a win, would have made the Hillary fundraising that much easier in the coming months, and the congressional fundraising easier in 2016. 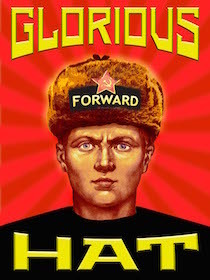 The only donors who'll vote now for the disaster that is the Democrat Party will be die-hards: white guilt types, abortion guilt types, Bolsheviks, etc. I see one good reason to pull ads from Mary Landrieu, from the Democrat perspective of course. If she is abandoned now, Obama would have no reason not to unleash his anti-America executive orders. 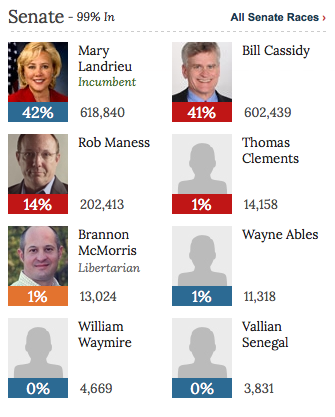 I really like the Louisiana rules for a runoff if no candidate reaches 50%. Election season is not over and, with a close Senate, it adds pressure for moderation from both parties. I also like the Louisiana rules when you consider one or more spoiler candidates may be in the mix. Intellectual Froglegs posted a short victory [dance] video. And Dr. Tar over at IOTWReport tells us the Teacher Unions are out $80 million on the midterm elections. Does that mean the MSM outlets are up $80 million? Nice Job GOP. Now Get To Work. The Vote for "Less Evil"